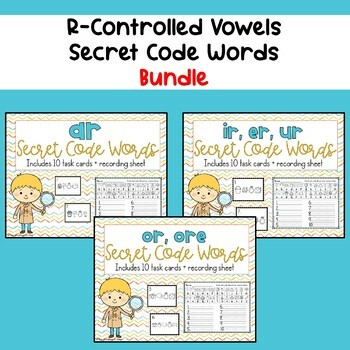 Your students will have a blast practicing R-controlled vowels with this engaging activity! See above for the three individual products included in this bundle. *Print the task cards. Cut them out and laminate for durability. *Print a recording sheet for each student. *Place task cards in a literacy center or use as a “scoot” game. *Students must crack each code and record the secret word. *An answer key is also included.